I post below are two emails and coin images received from Mr. K. W. of U.S.A. The background story of this cash coin is quite interesting to me. Subject : Kuang Hsu coin mint in Canton? I've come across your nice site while trying to identify a bronze/copper coin which I got from Lombok Island (diameter 24mm; thickness 0.9 mm only). It's a Chinese coin (Kuang Hsu period?) 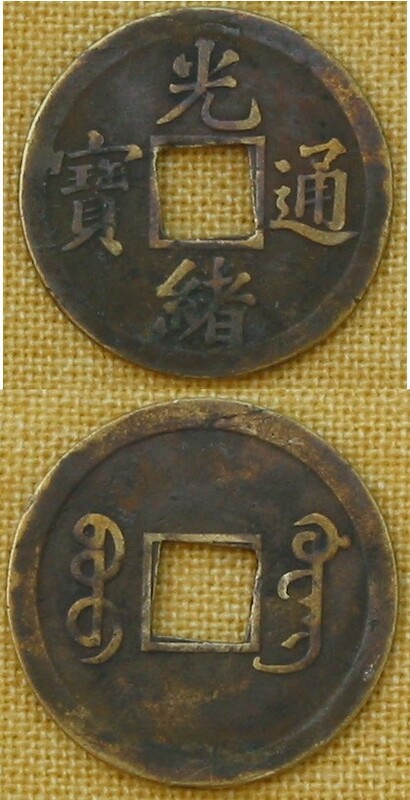 with Manchu script (Canton mint) on the reverse. Would this date the coin between 1889 and 1908? However, the hole is larger (approx. 6.2/6.5 mm) than other Qing coins I've seen - a counterfeit? However, this must be a quite common, inexpensive coin which would make a fake unlikely, wouldn't it? It's also very thin and the scripts are pretty broad - heavily worn down? I'd greatly appreciate any help you may be able to give me! Cash Coin Minting by Machinery page. It has been used as a guard of a 17th century dagger which I'm going to sell (pic attached if you're curious in non-currency usage of Chinese coins ;o). I guess this coin was taken out of circulation for this purpose soon after minting and kept as part of a Sasak family's heirloom - that would explain it's good condition. So this coin was minted from 1890 to 1899? Or was it still being produced after the new copper coins were introduced in 1900? Also thank you very much for your help and your online resources! Any additional comment would be much appreciated, you can send it to me.